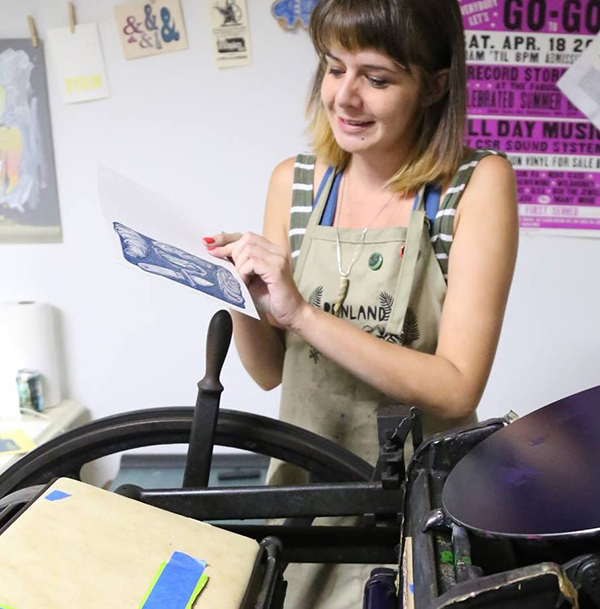 Molly Kempson of Spotty Boy Press wears many creative hats and has a knack for inspiring those around her. From making art (and joy!) with a local research hospital’s patients to working full time as an elementary art teacher, there is never a dull moment. The recent Coffey resident book artist (University of Florida) and Hamilton Wood Type’s New Impressions exhibitionist sat down with us to talk shop about life’s inspirations (from patients she has worked with to working with her local artist studio collective), exploring the 21,000 acre wildlife preserve mere minutes from her studio, and the Eureka! 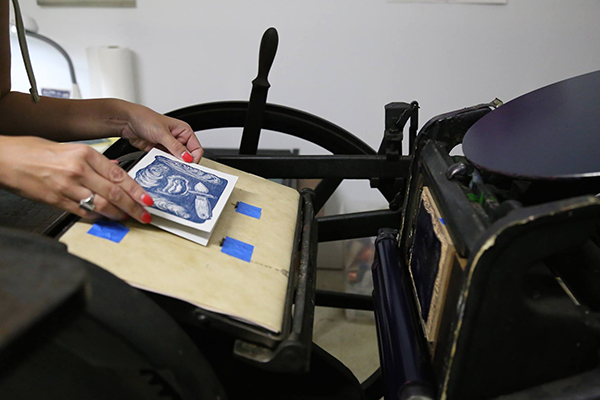 moment of when she used a linoleum block in her press for the first time. ADVOCATE FOR THE ARTS I’m an elementary art teacher and I make art with patients in my city’s research hospital as an artist-in-residence. I learn so much from teaching and take it to the studio with me. I’m pretty awful at science, but I like to think that I missed my chance as an understudy for Audubon and Bartram – I am obsessed with creatures. LOVE AT FIRST SIGHT I finished my M.A. in art education at the University of Florida last spring (2016). I pursued that degree with ambition for both becoming a better art teacher and to work alongside MFA printmaking students. I had been making linocuts for years, and took a class in intaglio and spent a miserable semester on the same plate – I couldn’t just leave it alone. I decided to take letterpress the next semester with Ellen Knudson, whose work I already loved. It clicked right away, and when I found out I could put linoleum blocks in the press it was all over. PRINTING COLLECTIVE I print in a collective of artist studios in Gainesville, Florida. Some folks are faculty or alumni of the University of Florida, and many aren’t – we’re a small town with a vibrant arts community outside of the university. Each studio is separate, but I love opening my door and connecting with the 19 other artists in my space. It’s my personal gallery of prints from friends. Trading with other multiple-makers (ceramicists as well as printmakers) has provided me with a space that is just buzzing with colors and details that want to keep me moving forward. FAB IN FLORIDA North Central Florida is full of springs, bright blue pools of water in the forests where manatees warm up in winter and alligators stay scarce. Being able to kayak in clear fresh water all year is something people don’t associate with Florida. I spend most weekends on the water without making it to the beach, which baffles some people. Gainesville has a ton of parks in city limits, too. I can bike to a 21,000-acre preserve full of sandhill cranes, bison, wild horses, and massive gators from my studio within fifteen minutes. 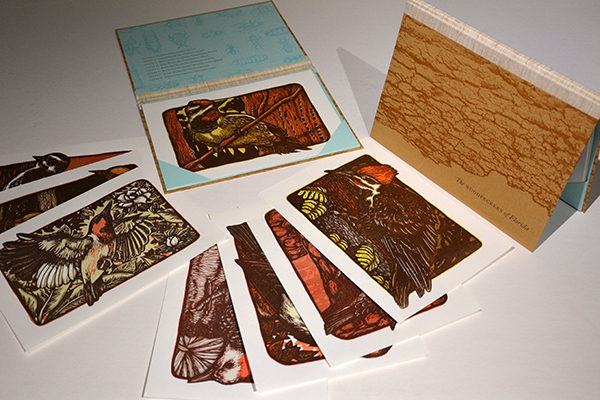 PRINTING MENTORS Ellen Knudson (Crooked Letter Press) taught me impeccable studio manners and problem-solving skills. Martin Mazorra taught me at Penland and helped me work through ideas faster using negative space more effectively. Sarah Shebaro (Striped Light) showed me what linocut letterpress can look like in a style that riffs off of modern quilting. It’s amazing. I am always entranced with Jennifer Farrell‘s ingenious typesetting and her ampersand series. 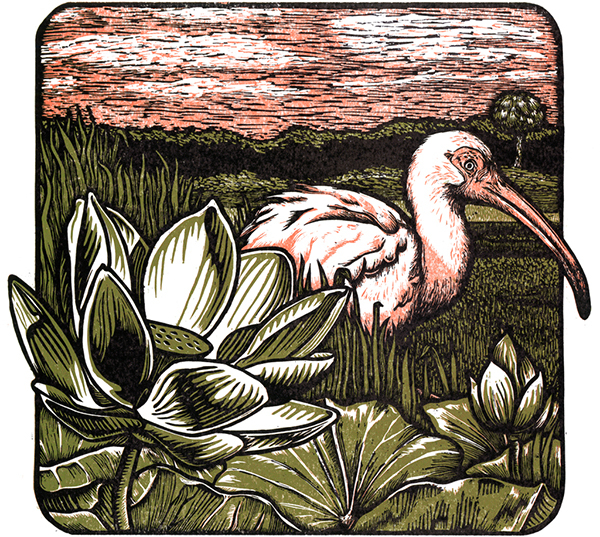 Ashley Taylor is a Florida printer constantly changing and mixing print mediums with intention and perfectly honed craft. She’s as comfortable making wood veneer letterpress matrices with Eileen Wallace as she is mixing day-glo puffy screenprinting over traditional etchings. PART TIME PRINTING, FULL TIME FUN I don’t print full-time. I would say 40% of my “work” time is spent printmaking, the rest teaching in my school and hospital. My work is reciprocal – I make work inspired by the people with whom I work. If it’s a kindergartener’s drawing of a snake she saw (or imagined) or my experience making a portrait of a patient/wildlife rehabilitator’s fox, it’s working material. I take it to the studio with me. My students and co-collaborators fuel my practice completely. PRINTING FEATS Last summer (2016) I was the Coffey resident book artist at the University of Florida’s special collections. I was able to continue working with Ellen Knudson, who did nearly all of the binding and most of the typography (I can carve all day, but I don’t consider myself a designer). Working with the natural history collections in UF’s special collections, I created a print portfolio of all of Florida’s woodpeckers with three-color reduction prints of each bird. 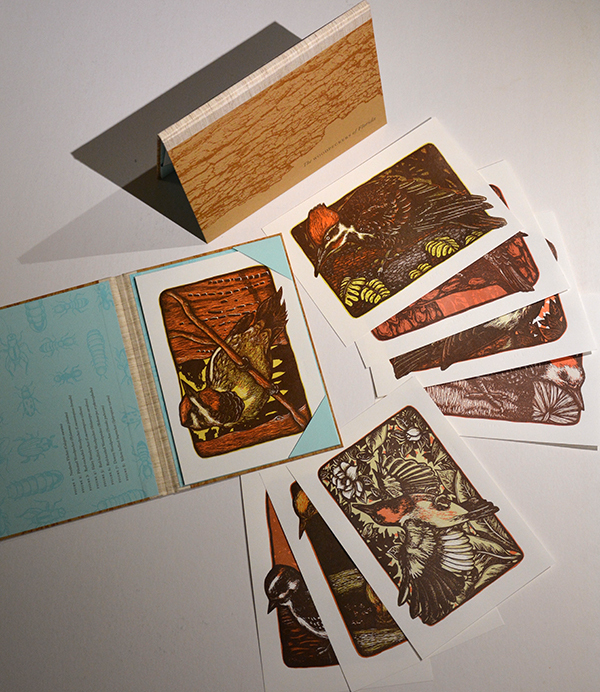 We made an edition of fifty artist’s books of eight prints each in portfolio cases. I was recently selected for the New Impressions exhibition at the Hamilton Wood Type and Printing Museum along with some serious print heroes. PRESS HISTORY My current press was actually my very first press! It’s a C&P 8×12, and I love it. I can’t print the big stuff I’m used to, but I’m adjusting. I have been carving linocuts in the chase and my reduction prints have never been better! I’m a teacher of small children and used to planning for the worst case scenario. Planning for a press move took months for me, and I was blessed with a wonderful seller (a great stationery printer in his own right – Matthew Wengard) and very enthusiastic & almost dangerously cavalier movers. If you’re a control freak, my only advice for a press move is to surround yourself with optimists experienced in moving heavy things. 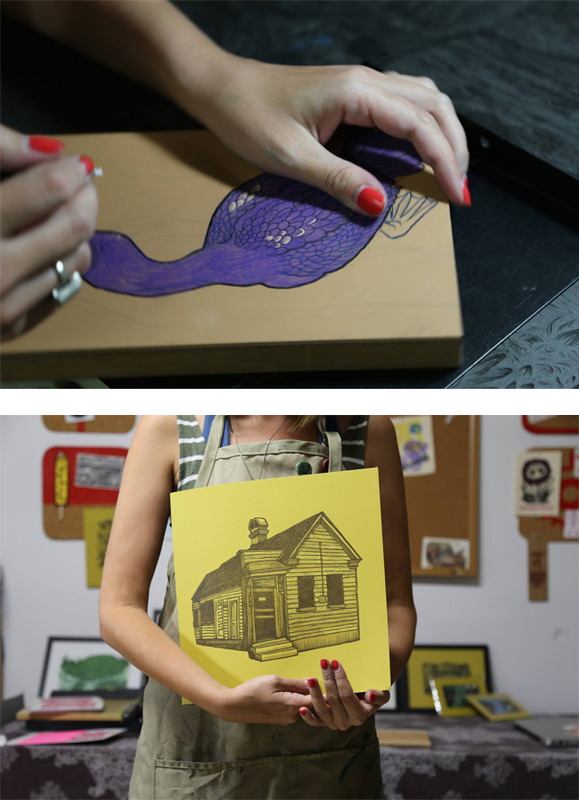 BOXCAR’S ROLE Boxcar lets me focus on my strengths – linocut and woodcut carving – while producing high-quality plates for book arts and stationery purposes. 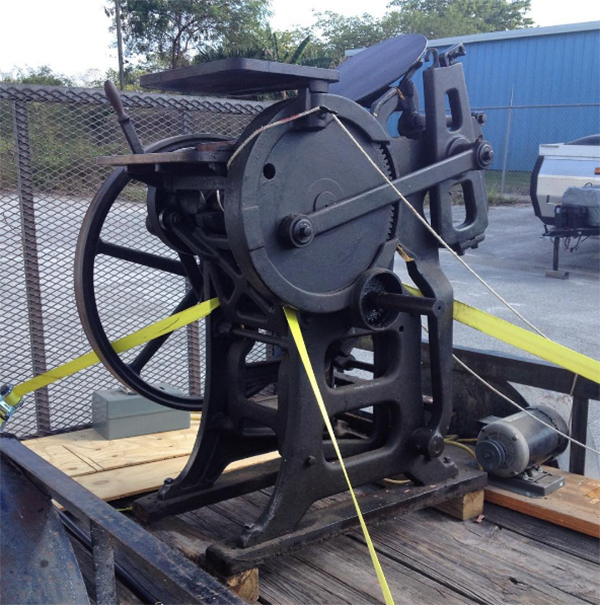 My artist’s book (the Woodpeckers of Florida) was printed and bound in eight weeks and wouldn’t have been possible without photopolymer plates – this project required 2400 passes through the press, leaving no time to set or distribute type. 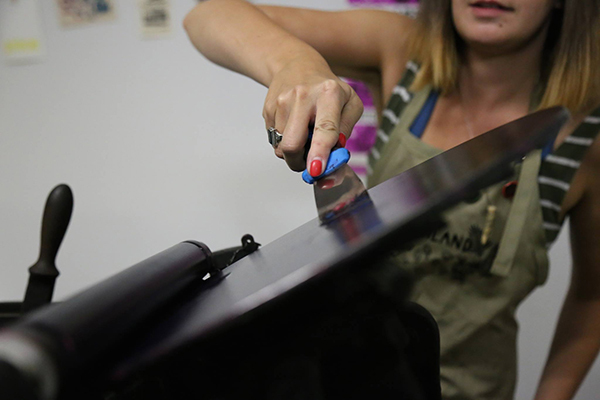 SHOP TIPS For platen press relief printers, carve in your chase! And for you reduction block printers on proof presses, watch and make notes on those quoins. Ghosts can haunt your registration, and no matter how neurotic you are, cut more paper than you will ever need for a reduction print. WHAT’S NEXT Another book arts project on North Florida vernacular language for plants, animals, and buildings is in the works. A huge round of applause out to Molly of Spotty Boy Press and we’re excited to see what new book arts & printing adventures she’ll be embarking on soon!